Recently acquired drawings from the spectacular private holdings of collector Eugene V. Thaw are the subject of an extraordinary new exhibition. The show features more than eighty works that have been added to the Thaw collection since 2002, many of them important modern drawings by artists such as Jackson Pollock, Georgia O'Keeffe, Robert Motherwell, Ellsworth Kelly, Agnes Martin, Jim Dine, and David Smith. The exhibition is the fifth at the Morgan since 1975 dedicated to the Thaw Collection, which is a promised gift to the institution. In addition to the remarkable selection of modern works, exceptional sheets dating from the Renaissance to the nineteenth century are also on view. Most of the works have not been previously exhibited. A pen-and-ink study of a Renaissance temple by Francesco di Giorgio Martini (1439–ca. 1501), drawn ca. 1470, and a mixed media-representation by Jim Dine (b. 1935) with imagery inspired by a dream, dated 2000, signal the wide chronological, technical, and conceptual range of the exhibition. Drawings by traditionally acclaimed draftsmen, such as Boucher and Matisse, are joined by fine examples by lesser-known artists, such as Daniel Lindtmayer (1552–1602) and Edouard von Steinle (1810–1886). The old masters, a traditional strength of the Thaw Collection, shine with a sensitive pastel of a male head by Federico Barocci (1535–1612) and a topographical view of Tangiers enlivened with watercolor by Wenceslaus Hollar (1607–1677). Landscapes by northern artists of the seventeenth century also include a typical Dutch riverscape by Willem Buytewech (1591–1624) and an Italianate landscape by Jan Asselijn (1610–1652). The tradition of recording landscapes in drawing continues more than a century later with works by Caspar Wolf (1735–1798), Adrian Zingg (1734–1816), Francis Towne (1739–1816), and a delicate and sensitive study of clouds on blue paper by Johann Georg von Dillis (1759–1841). French drawing is represented by a dynamic study of Italian gamblers by Jean-Baptiste Greuze (1725–1805) and a floral design by Pierre Joseph Redouté (1759–1840). Two exquisite portrait drawings by Jean-Auguste-Dominique Ingres (1780–1867) that have been long hidden from public view are among the highlights of the Thaws' recent acquisitions. They represent the first full-length studies by Ingres to enter the Morgan's collection, joining three portraits and four additional sheets from the Thaw collection and nine other drawings by the artist. Another rare treasure is a large pastel by Paul Gauguin (1848–1903) of two girls in Breton costume. The richly colored and energetically worked pastel is preparatory for the painting Breton Girls Dancing, executed during the summer of 1888 and first shown in Paris that fall. Now in the National Gallery of Art, Washington, the canvas marks Gauguin's return to figure painting after a period of landscapes. Also on view is Figure of a Woman (Camille), 1865, by Claude Monet (1840–1926), which likely depicts Camille Doncieux who would later become Monet's wife. This rare example of Monet's draftsmanship was produced early in the artist's career when he was tackling a large canvas depicting a luncheon party of elegantly dressed figures picnicking in a garden. Monet would, however, abandon the unfinished painting in 1866. The later German school is well represented by two drawings by the great Romantic painter Carl Gustav Carus (1789–1869) and an atmospheric sketch reminiscent of the Bay of Naples by writer, poet, and amateur artist Johann Wolfgang von Goethe (1749–1832). Nine drawings illustrating the Lord's Prayer by Joseph Ritter von Führich (1800–1876) offer a unique set of studies for engravings that complement the Thaws' holdings of drawings from the German Nazarene movement. A subtle and introspective black-chalk-and-wash drawing by Adolph Menzel (1815–1905) depicting a lone man seen from behind stands at the cusp of the modern era. The modern drawings represent the diversity of the medium during the twentieth century and include fine examples of major artistic movements. Collages by Kurt Schwitters (1887–1948) and Joseph Cornell (1903–1972) expand the traditional definition of drawings. A small sketch by Alberto Giacometti (1901–1966) records one of his signature sculptures in a play of frenzied lines. A major work by Jackson Pollock (1912–1956) headlines a group of postwar drawings by Americans Franz Kline (1910–1962), Agnes Martin (1912–2004), and Ellsworth Kelly (b. 1923). The exhibition concludes with a spare line drawing from 1993 by David Hockney (b. 1937) of charming dachshunds resting. The Thaw Collection of Master Drawings: Acquisitions Since 2002 is organized by Rhoda Eitel-Porter, Charles W. Engelhard Curator and Department Head, and staff of the Department of Drawings and Prints, the Morgan Library & Museum. This exhibition is made possible through the generosity of Melvin R. Seiden and Donna and Bill Acquavella. Additional generous support is provided by the Janine Luke and Melvin R. Seiden Fund for Exhibitions and Publications. 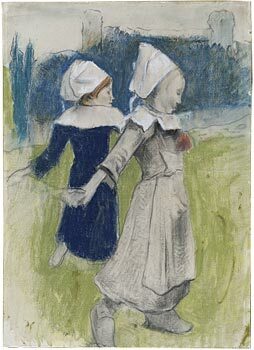 Paul Gauguin, Study for Breton Girls Dancing, 1888, pastel and charcoal, with watercolor and gouache, on cream-colored paper, The Thaw Collection, The Morgan Library & Museum.